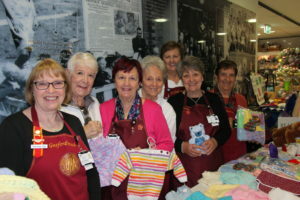 Dedicated volunteers from the five Central Coast auxiliaries have baked, knitted, sewed, and raffled their way to more than $138,000 in combined donations for our local hospitals in the past financial year. This phenomenal effort from Gosford, Ourimbah, Wyong, Woy Woy and Long Jetty auxiliaries has provided Central Coast Local Health District (CCLHD) with a boost of much-needed funds. CCLHD Chief Executive Dr Andrew Montague extended his thanks to all the Central Coast auxiliary volunteers. “On behalf of CCLHD, I am extremely grateful for the hard-work and generosity of our local auxiliaries,” he said. “Over the last 12 months they have put in a great deal of time and effort to fundraise for our health services. The combined donations have enabled CCLHD to purchase a range of vital, new equipment to benefit patients. “These items help us to provide the best quality care and improve patient experience,” Dr Montague said. The Central Coast auxiliaries are always looking to recruit more community-minded locals who are willing and available to help out with a wide range of fundraising activities. If you would like to join one of the five local auxiliaries (Gosford, Ourimbah, Wyong, Woy Woy and Long Jetty) contact CCLHD Manager Fundraising and Donations Jan Richens for further details on 4320 3659.